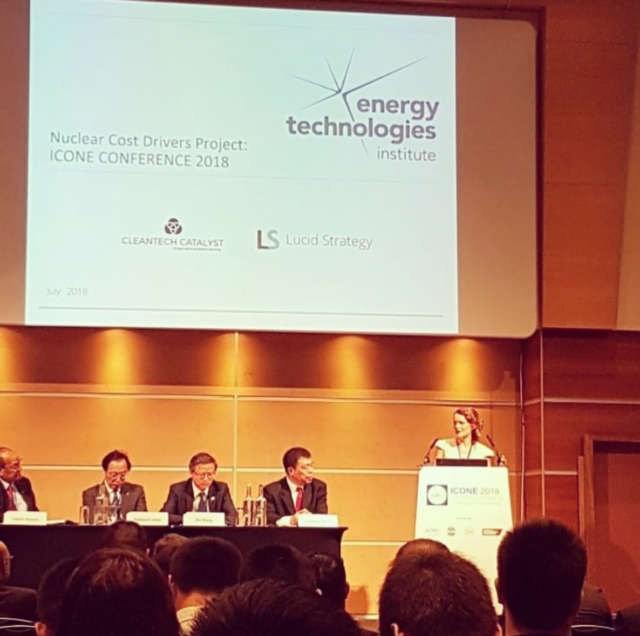 Energy for Humanity Global Director, Kirsty Gogan, gives the keynote address at the prestigious nuclear engineering conference – International Conference on Nuclear Engineering, co-hosted by the Institute of Mechanical Engineering (IMechE) – in London. The International Conference on Nuclear Engineering came to the UK for the first time last week and the IMechE had the pleasure of being a co-host. One of the standout features of the conference was the pre-eminence of China, which is fast becoming the world leader in civil nuclear energy. The 26th International Conference on Nuclear Engineering took place in London from 22-26 July. Around 900 delegates from industry and academia, including almost 100 students, came together in the Novotel London West hotel for five days of fascinating workshops, presentations, poster sessions and social events. As a co-host and host nation, the Institution of Mechanical Engineers played a key role in making the conference a success. Our members were involved directly with around 20 volunteers having peer reviewed many of the hundreds of papers that were submitted to the conference and our membership links helped to arrange a special tour for conference delegates of the JET nuclear fusion facility in Oxfordshire. The IMechE executive team helped with gaining sponsorship for the event and with arranging keynote speakers. Our CEO, Dr Colin Brown, gave a welcome address in which he praised the UK’s Nuclear Sector Deal, especially its ambition to attract more women into nuclear engineering. The conference was co-hosted with our sister organisations, the American and Japanese societies of mechanical engineers (ASME and JSME), as well as the Chinese Nuclear Society. Attending the conference and looking at the list of papers submitted – over half of which were from Chinese delegates – it was hard not to be impressed by the rise of China as a force in civil nuclear power. With much of the Western world having gone cool on nuclear, growth in new build nuclear worldwide will be driven by Asia, particularly China where over a third of the new reactors under construction are to be located. Most of these will be conventional pressurised water reactors used for generating electricity, similar to the standard nuclear power plants that have dominated the market since the 1980s. However, this conference has shown that China has also begun to race ahead in more advanced reactor designs. Whilst other countries are dipping their feet in ‘Generation IV’ technology, China is going full steam ahead with the development of a fleet of different advanced reactors. Notable examples include CAP200 and CAP50, small modular reactors (SMR) that will be used not just to produce electricity, but also for additional applications like desalination and district heating, a use for nuclear energy that was tried successfully in several countries in the past, but that has not been replicated to any large degree since. Dr Xujia Wang from Shanghai Nuclear Engineering Research and Design Institute (SNERDI) said that SMRs cannot compete with large reactors on cost if selling electricity to the grid alone and that they have greater potential if used for off-grid electricity and for multiple application reactors. In the Western world, the UK has become an attractive destination for reactor vendors. We are one of the only countries with ambitious new build plans as well as being serious about investment in small modular reactor development. Indeed, when the Department for Business, Energy and Industrial Strategy issued a call for companies interested in developing an SMR on British soil, 33 companies came forward, most from outside the UK. The mood of American delegates was slightly downbeat. A perfect storm of bad economic conditions for nuclear power – cheap natural gas, a liberalised electricity market, and the lack of a serious carbon price – mean an almost complete absence of new build plans in the USA. This has not dampened enthusiasm for the development of next generation reactors, however. Dr Paolo Ferroni from Westinghouse gave a convincing and upbeat explanation of their lead cooled fast reactor development, in which he highlighted the importance of engineers thinking about economics at every stage of the design process. This was the also the central theme of the keynote address by Kirsty Gogan, founder of both the NGO Energy for Humanity UK and the consultancy Cleantech Catalyst. The nuclear reactor construction industry has been plagued by cost and schedule over-runs in recent years and Cleantech Catalyst was commissioned by the Energy Technologies Institute to find out why and whether this can be rectified. Their answer was yes, but only if industry best practice was applied throughout the design and construction process. She went as far as to say that the UK Government should make support for new nuclear power contingent on signing up to best practice principles. The well-attended and fascinating conference showed that there is still worldwide enthusiasm for nuclear power as a low carbon source of energy and a surprisingly youthful delegation showed that young engineers think the industry has a future. However, with China being so dominant in the sector it remains to be seen whether any other country has the ambition to compete in an industry where the existence and support of a large centralised state is difficult to overemphasize. This blog post was first posted here.